Tuesday, February 9- Wednesday, February 10, 2010. At 2:30 pm we gathered up our 3 line handlers and motored through the maze of anchored freighters, tankers, etc. to The Flats. This is an assembly point for the entrance to the Gatun Locks. Since sailboats are so small and displace so little water, they are usually rafted to a tug, another small boat or in sets of three, to each other. 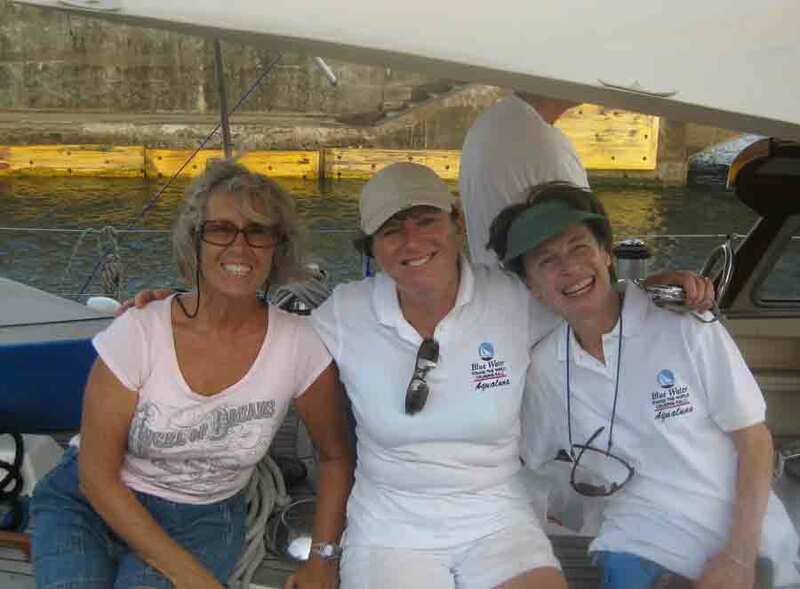 We were the port side of a three boat raft, with the largest and most powerful boat, SPIRIT OF NINA, a large catamaran, in the centre. Her role was to be the primary locomotive force for the raft. 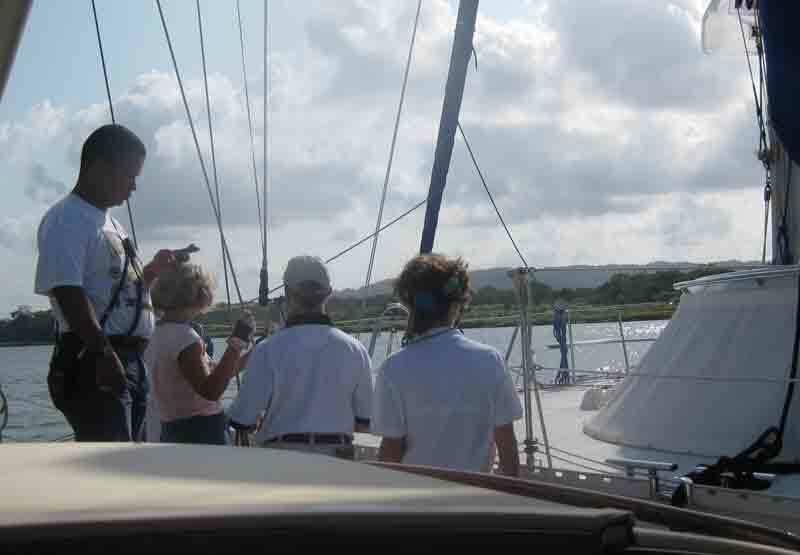 The other two skippers, Dave and Norman from NORSA, were subject to commands from their own boats' advisers and everyone deferred to the centre boat adviser. Line handlers on the centre boat are rather redundant, but one never knows if the boats will separate during the crossing of Gatun Lake, so each boat MUST have four handlers aboard. A Pilot boat delivers the advisers and then the journey begins. Rafting with SPIRIT OF NINA. 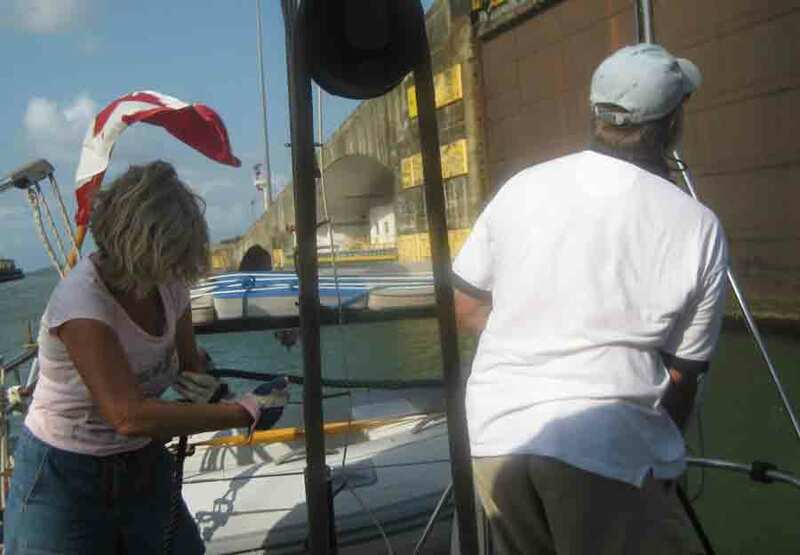 As the boats assigned to a lock enter, each small individual boat or raft must catch the line that ends in a monkey fist knot, hurled from the sides of the lock. Then the heavy warps or mooring lines must be attached quickly and they are then taken back up to the sides so that the mooring lines can be attached to bollards. As the lock fills up, the line handlers must keep the tension equalized so that the entire raft is not swept against the sides of the lock. This is a lot more demanding than it sounds. Winds tend to push the raft sideways and there is an incredible amount of turbulence as the water level rises and from large ships' engines as they try to assist their mules. 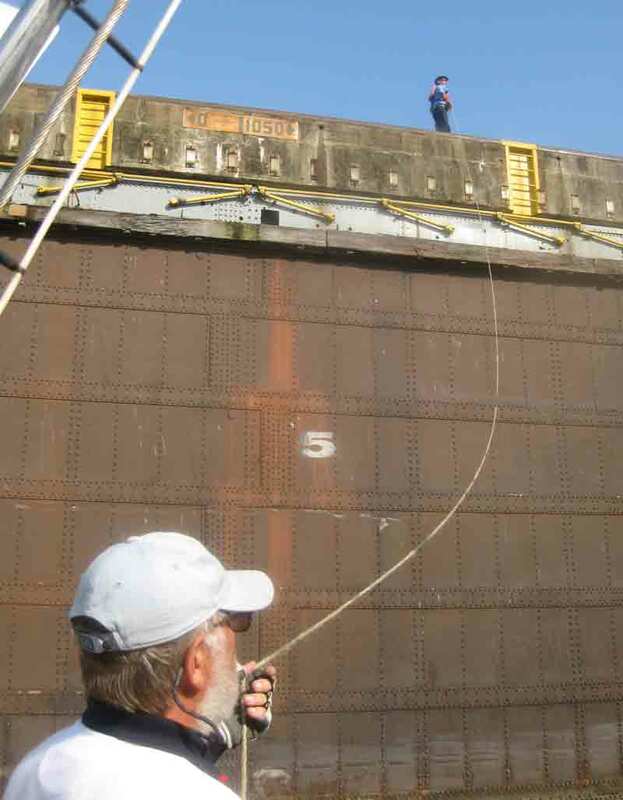 In the case of large ships (Panamax freighters are built to completely fill the lock by themselves), a rowboat takes the cables out to the ships. Then little "trains" or mules, one for each line, keep the tension equalized and travel along tracks at the side of the canal. John catching the monkey fist. 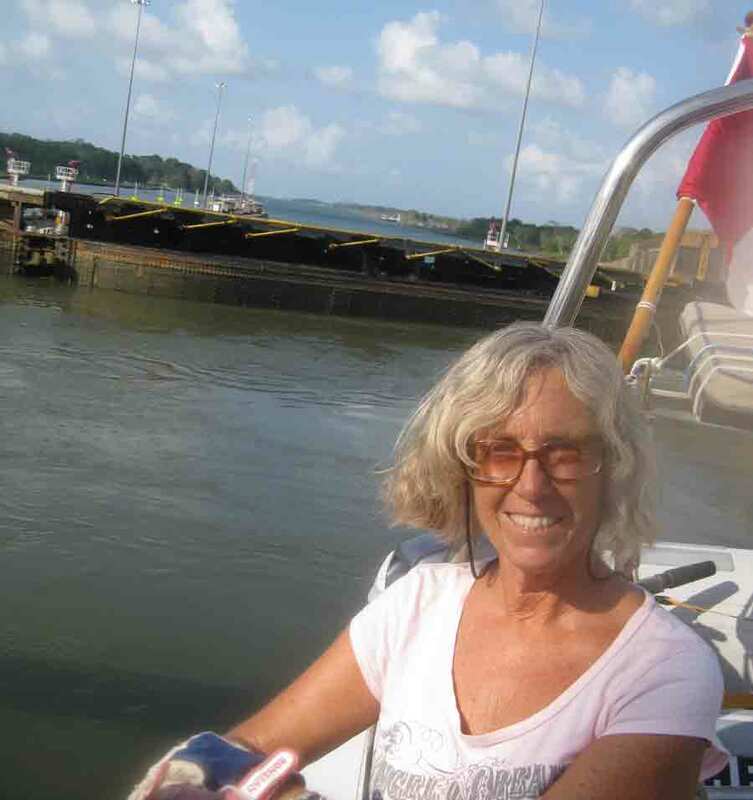 Looking back after going through the first Gatun Lock. Looking at the date of construction, this is one of the world's most amazing structures. A true wonder of engineering and conquering a very hostile environment. New wider locks are being constructed to accommodate ships even larger than the Panamx freighters. 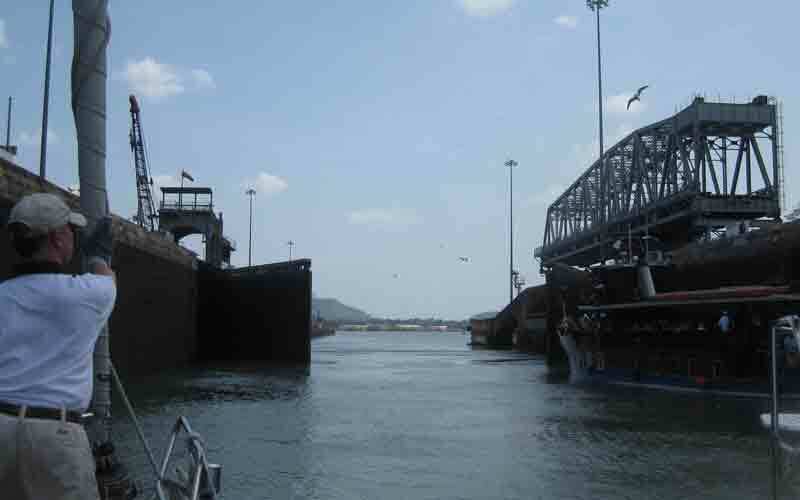 The locks are scheduled to be completed in 2014. 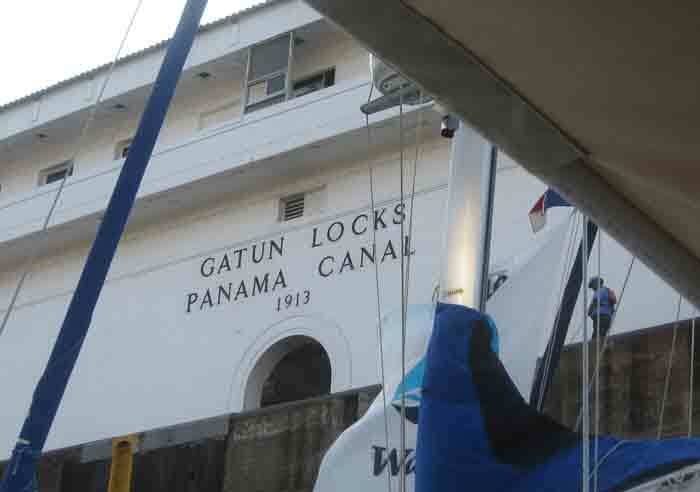 One must pass through three locks to reach Gatun Lake at the highest elevation of the canal. This lake was originally the Chagres River, which was flooded at this point to create the lake. Guy De Lessops, the French creator of the Suez Canal, began to construct the Panama Canal with the view of making it all at sea level. Many years and much money later, it was decided that it couldn't be done and the Americans, under Teddy Roosevelt's urging designed and built this impressive lock system. Landslides, malaria, yellow fever, and accidents claimed the lives of many many workers before the path between the seas was completed. 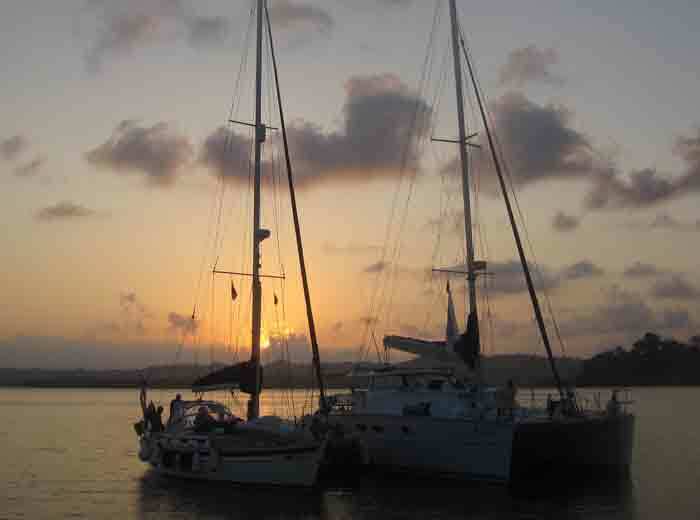 We rafted together with five other boats on two moorings in Gatun Lake. We enjoyed lovely dinners and convivial company and fell asleep exhausted. Morning- and our new adviser arrived far too early! Transitting the downhill portion of the locks was a breeze when compared to line handling on the upward trip. We felt like old pros by the time the last gate opened and we saw the Pacific for the first time.